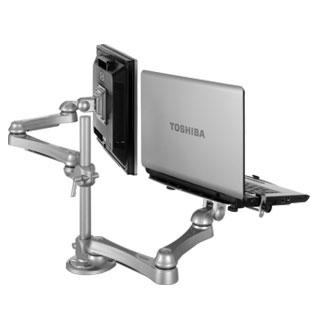 Large clamp mount fits surfaces up to 2.75" thick. Clamp is two-piece, front fastening to simplify installation in an existing workstation (requires 1/4" clearance between desk and panel or wall for surfaces up to 1.5" thick, 1/2" clearance for surfaces 1.5" - 2.75"). Turn-handle allows clamp repositing without tools. Grommet mount fits surfaces up to 1.5" thick. Fastens together using bolt and 3.75" long clamping bar. Grommet base will cover up to 2.5" diameter. For thicker surfaces 1.5" - 3", order LONGBOLT-SLOT.